Synthetic peptide corresponding to Human SRCAP aa 309-322 (internal sequence) (Cysteine residue). Our Abpromise guarantee covers the use of ab219181 in the following tested applications. Catalytic component of the SRCAP complex which mediates the ATP-dependent exchange of histone H2AZ/H2B dimers for nucleosomal H2A/H2B, leading to transcriptional regulation of selected genes by chromatin remodeling. Acts as a coactivator for CREB-mediated transcription, steroid receptor-mediated transcription, and Notch-mediated transcription (from SwissProt). 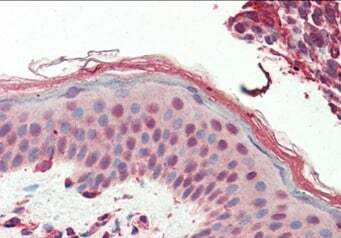 Immunohistochemical analysis of paraffin embedded formalin fixed human skin tissue labeling SRCAP using ab219181 at 5 µg/mL. ab219181 has not yet been referenced specifically in any publications. Publishing research using ab219181? Please let us know so that we can cite the reference in this datasheet. There are currently no Customer reviews or Questions for ab219181.